Thinking about hiring a marketing consultant? Great! But first, you’ll want to read this. Below I’ll cover a few clear signs that you need a consultant, along with some tips to make sure you find the right one. A marketing consultant is an outside business professional who works with companies to create and implement marketing strategies. Ideally, they have years of experience in the industry. They’re able to see a plan through all stages – including creation, messaging, targeting and delivery. A capable marketing consultant should be equally familiar with analytics and campaign monitoring. They can tweak messaging or delivery method as needed, and ultimately deliver the promised results to each business they work with. And that’s the real job of a consultant – to meet the goals of your company. Whether it’s more organic search traffic, higher ROI from social media campaigns or more blog subscribers, a consultant works with you to deliver and help you meet those goals. Why do People Hire a Marketing Consultant? The reasoning here is pretty straightforward: they have a particular skill your company needs. A (good) marketing consultant has experience and proven results in their field. They often come in handy when a business is just starting out, or has a particular goal in mind they need to accomplish. And while you may be the visionary who sets the goals, a consultant has the know-how to make those goals a reality. Sure, you could always hire someone internally to take on the job. But the other perk of a consultant? They generally save you money. Yes, their rate may be higher. But it saves you a full-time salary and any benefits associated with it. Say you’re preparing for a product launch or company unveiling. You need an expert in the field – but just for this assignment. That’s when you hire a consultant. Or, maybe you have a great product or idea but no real strategy in mind to market it, or working knowledge of how all the different pieces fit into an overall marketing plan. It’s not a bad deal – for your business or the consultant on hand. What is the Difference Between a Marketing Consultant and a Marketing Agency? A marketing consultant is generally a one-man show. A marketing agency, on the other hand, is a full-service business with the capability to handle all aspects of the marketing process. Both are focused on marketing and should be familiar with all aspects and tools available to make marketing magic happen. Bandwidth and Availability – An agency is likely fully-staffed, and therefore fully responsive to your needs. A consultant likely has multiple clients and may have limited time in the day to deal specifically with your company. Personal Attention – On the flip side, with a consultant you know exactly who you’re working with. And because the success of their business and reputation is dependent on relationships like yours, a consultant may be more inclined to go the extra mile for your company. Often, an agency will take on a large number of clients and offer routine services, while a consultant will focus on a limited amount of clientele, allowing them to offer personalized attention and services. Scope of the Project – For particularly large, ongoing projects, an agency can come in handy. Multiple people on the project can often expedite results, especially when dealing with a full marketing plan implementation. Specialized Skill Set – Oftentimes a company has a very specific goal, whether it be better performing SEO or a well-developed social media strategy, or anything in between. One benefit of a consultant is that you can find someone who specializes in your area of need, rather than bring on a full-service agency. Scalable Costs – Going the consultant route can also be more cost-effective. Rather than paying for an entire agency, you’re paying only for one person to do a specific job. Do keep in mind that modern marketing strategies often include the use of sometimes costly tools for analytics, keyword research, etc. which are often unrealistic for consultants to provide. Agencies, on the other hand, can likely absorb the cost and offer them to your company. Hiring a marketing consultant comes with a unique set of challenges. So, as with any other employee, you’ll want to put each candidate through a thorough screening process. In this case, there are specific things to watch for. First of all, anyone can say they’re a consultant. The recent college grad with no references and very limited experience can call themselves a consultant. Even Bob from down the street who used to work in banking can suddenly claim the “marketing consultant” title. So have a conversation with them. Don’t be afraid to ask hard questions. And most importantly, check references and ask for proven results. Part of the problem is that there are really no formal qualifications needed to become a marketing consultant. As you well know, marketing is a broad field, and it’s rare to find a jack-of-all-trades. Which makes it extremely important to have some idea of the results you want before looking for a consultant. For example, if you’d like to increase your website traffic and social presence, don’t hire someone whose main experience is with radio and TV. You need a digital and social media expert. Another red flag should fly if they have no experience with your particular industry or niche. Sure, they could have years of experience and a spot-on portfolio, but if you’re selling parts to automobile companies and most of their work is in the financial industry, they may not be the right fit. It’s not always a deal breaker; some industries intersect and some strategies work well with multiple niches, but it’s always advisable to ask for specific experience with your or a related industry. If your marketing team is a bit green, it’s definitely time to look into hiring a consultant. They will be able to spearhead your strategy and oversee its implementation, and your team will gain valuable experience and insight in the process. Many consultants will take time to teach their clients how to do their jobs more effectively. This way, your internal team can get their feet wet with the added assurance of an expert on hand to step in when needed. While the occasional plateau is inevitable, it’s really all about how you handle the recovery. A good recovery takes some reinvention, which means fresh ideas and new products, plans or campaigns. Que the marketing consultant. A little fresh blood can go a long way – especially when the person has a proven track record of success. So if you find that your once thriving business has stalled, call a consultant in. Think of marketing strategies like puzzles. You have tons of pieces floating around – social, content, SEO, PPC, etc. And to complete the puzzle, you need to put all the pieces together. Which brings us to our next clear sign. Because sure, you might have your hands on all the pieces. But if each one acts independently, you’ll never get the desired results. And to get there, you need a goal. If you have no clear endgame in mind, your team will likely fracture into different directions. A good consultant can work with your team to guide them through an overarching strategy – one that identifies your ultimate goal and fits each piece of the puzzle into a plan. This goes hand in hand with the above. 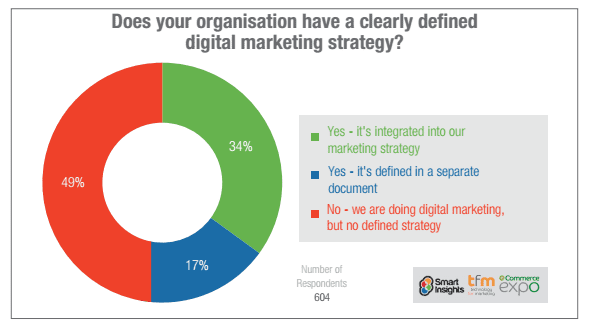 For example, say you’ve been in business for years but still have no real digital strategy (you wouldn’t be alone – SmartInsights reports that 49% of businesses have no digital strategy in place). But make no mistake – you do need one. A marketing consultant can tell you what exactly all these channels are working together to achieve, and how to execute for the best results. Naturally, you want to make that strategy is the best. Plain and simple, hiring an expert will make your business more successful. Those that want to be the best surround themselves with the best. And that should include your marketing strategist. Last but not least, a marketing consultant provides much-needed reliability. When you get a negative review on Facebook or nasty comment on your blog, call your consultant. If your traffic suddenly plummets, call your consultant. If your website’s suddenly taking 30 seconds to load, call your consultant. Beyond the strategy, a consultant is your go-to when you need help, advice, and a little expertise. You know what to do. Find a consultant, screen them for quality, and let them do your marketing dirty work.